The Hillsborough County School Board unanimously approved the charter application for Kid’s Community College Middle School in Riverview.The Riverview expansion will see the construction of a 5,000-sq.-ft. campus in phase one, followed by planned growth in its second year. The educational leader currently employs 95 associates, and this latest expansion will add 20 jobs in Riverview over the next two years. “Expansions such as this not only offer new professional opportunities in a profession recently besieged by cutbacks and layoffs, but it also encourages economic stimulus in a local rural community that is experiencing its fair share of financial challenges,” commented Kid’s Community College President Timothy Kilpatrick. Lake Saint Charles Director of Charter School Operations Nicole Williams attributes the continued growth and success of the organization to a continued focus on putting the student and community needs first and placing a high value on the associates of the company. “Being able to work with our board, parents and this community to plan this growth has allowed us all to grow and bring the company’s long-term vision into clearer focus in the community. Naturally, that is to the benefit of the students, and it’s exciting to be able to extend our successful system of learning into the middle school arena.” “The children in our program are individually motivated and encouraged to perform at an advanced level, are held to a higher standard and we enjoy an extremely high satisfaction rating with our parents. The group of professionals we select to lead our middle school will continue to be the best and brightest in their fields and must be creative, committed and passionate about individual student success,” concluded Kilpatrick. The middle school campus will only admit 66 families in its first year, increasing enrollment to a maximum of 198 students by year three. Open enrollment for the middle school will begin in January for the much anticipated August 2010 opening. Parents interested in enrolling a student are encouraged to call 671-1440 for registration information. Interested educators should forward their resumes and cover letters to: Colleen Donovan, c/o Kid’s Community College, 10530 Lake St. Charles Blvd., Riverview, FL 33578, or e-mail to info@kidscc.org. 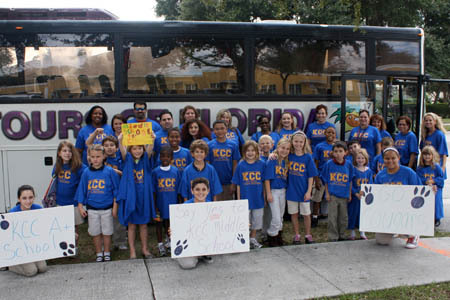 Please visit www.kidscc.org for more information or to enroll/apply online.